My mum bought this fabric in the 70’s. The gorgeous psychedelic large paisley print is just as vivid in reality as in the photo, even though the gold line work doesn’t really show. One of the largest prints I have seen I was discouraged from wanting to cut into it even though I loved the colours. There was too little fabric for the kimono style dressing gown I thought it would suit, so for a long while I just pondered. Eventually it called me to practice free motion quilting. The original idea was to do a wall panel but Tricia from Tricia’s discount fabrics encouraged me to make a quilt and with her assistance I chose a purple wide back and a wool and poly blend wadding. Struggling to manipulate the weight, I free motion quilted around the designs on my trusty old Pfaff 1475 using King Tut thread in the Luxorious colour way. 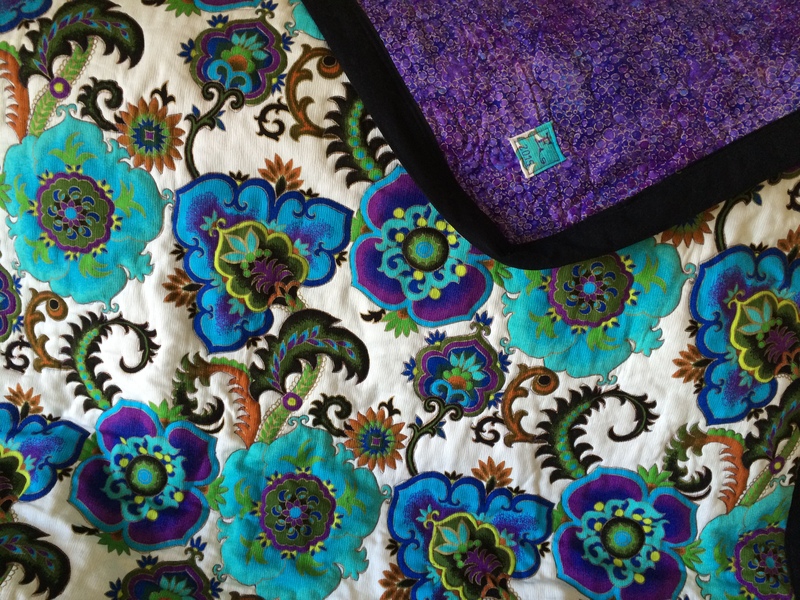 It wasn’t long before I purchased the Gypsy quilters fabulous fabric glide from OzQuilts which helped considerably. If I ever decide to do another large quilt a Supreme Slider, or similar, will be the first item on my shopping list. Some people use a silicon spray, but I wasn’t able to find one that claimed to be safe for fabrics and didn’t want to take the risk of any stains. Eventually it was back to Tricia’s to find a binding, and after much perusing, Tricia suggested a plain black binding. As soon as I started attaching the binding the whole quilt just ‘brightened’ before my eyes. I used the Pfaff ‘stitch in the ditch foot with guide’ from Allmake Sewing Centre to attach the binding without hand sewing. As I had no idea what the fabric would be called searching on Google images didn’t get me very far so I asked the lovely ladies on the Quilt Club Australia Facebook group for help in naming and soon had many wonderful suggestions. Psychedelic Blue Groove seems to describe it, quite aptly I feel.